Silver compounds are typically X-ray sensitive. 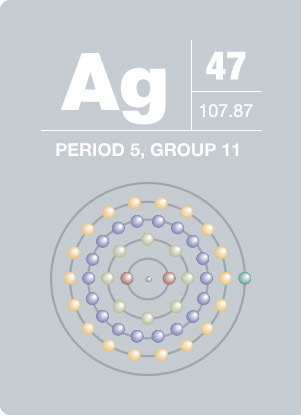 Ag3d region has well separated spin-orbit components (Δmetal=6.0eV). 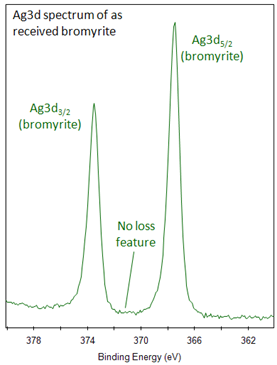 Loss features are observed to higher binding energy side of each spin-orbit component for Ag metal. Small binding energy shifts for compounds, such as oxides. o Ag3d peaks broaden with respect to metal peaks. 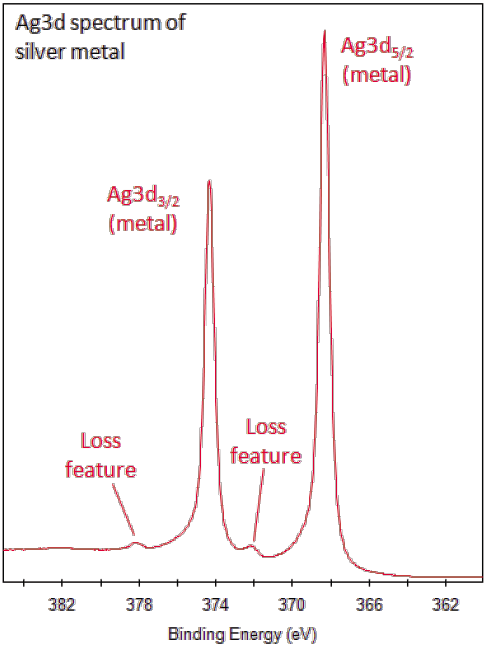 Ag3d peaks broaden relative to metal peaks. Silver’s main use is as a precious metal. Sterling silver, over 90% silver, is used in flatware and jewelry. Silver’s malleability and ductility, physical appearance, and value make it a common material in coinage. Of all metals, silver has the highest electrical and thermal conductivity, but because of silver’s high cost, copper is commonly used in electrical applications. United States coins were minted of silver until after 1964. Silver’s halide salts are widely used in photography. The South American country Argentina, known as a source of silver, takes its name from the Latin word for silver, argentum.